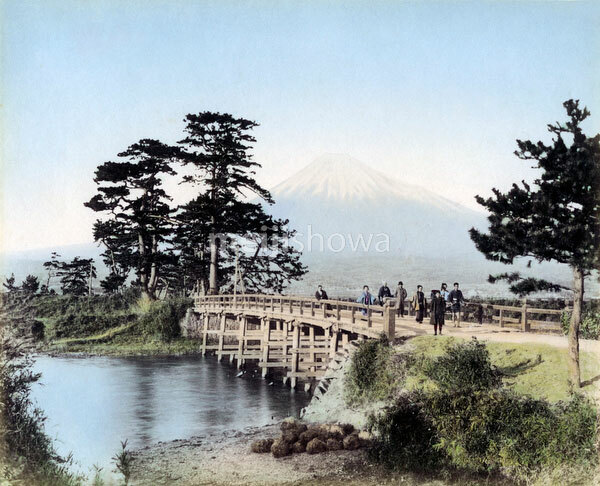 Kawaibashi Bridge spanning the Numakawa River near Taganoura on the Tokaido. In the background Mt. Fuji can be seen. The Numakawa flows from Ukishima Pond towards Tagonoura. Before the bridge was built during the Kanbun Era (1661-1673), people crossed this location by ferry. Across the bridge electricity poles can be seen, indicating that this photo was taken during the 1880s.